AFC Rushden & Diamonds are set to play their final home game before Christmas when they take on Halesowen Town in a re-arranged fixture at Hayden Road. Tonight’s clash is followed by back-to-back away games at Leiston and Alvechurch while Diamonds’ home game against Stratford Town, originally scheduled for December 15, will now have to be re-arranged after Stratford progressed into the first round of the Buildbase FA Trophy. That leaves Diamonds facing another away match at Redditch United on December 22 before they take on St Neots Town at Hayden Road on Boxing Day. It means there is extra emphasis on this evening’s game against a Halesowen team who were thrashed 8-2 by Spennymoor Town in the FA Trophy at the weekend while manager John Hill is taking charge of the side for the final time tonight. 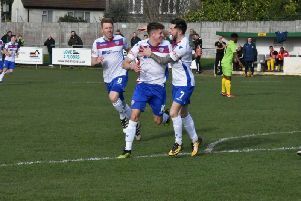 But for Andy Peaks and his players, it’s an opportunity to build on the 1-1 draw at Lowestoft Town at the weekend, which kept them just a point off the play-off places in the Evo-Stik League South Premier Division Central. “It’s a home game that has been thrown into the middle of a run of away matches so it’s an important one for us,” Peaks said. “We were pleased with the draw in the end at the weekend but that only becomes a really good point if we follow it up. “It won’t be easy, it’s the last game for the Halesowen manager and I am sure the players will want to make sure he goes out on a high. “From our point of view, this could now be our last home game until Boxing Day because of Stratford getting through to the next round of the FA Trophy. Jack Westbrook is definitely ruled out for Diamonds tonight as he begins a three-match suspension following his red card in the defeat at Banbury United a week ago. And they could also be without captain Liam Dolman, who was forced off with a calf injury at Lowestoft, while striker Jack Bowen also missed the game at the weekend.